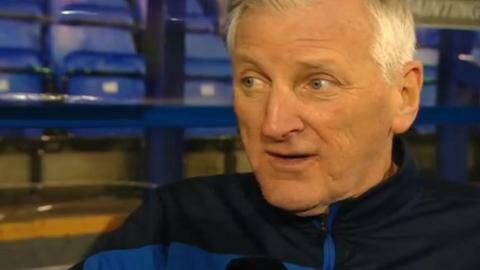 Hartlepool United boss Ronnie Moore says the manner of their 1-1 draw with fellow strugglers Tranmere Rovers is evidence of continued improvement. Pools fell behind to a goal from Kayode Odejaye inside 12 minutes, but responded immediately when Scott Fenwick crashed home an equaliser. The point gained was just the eighth away from home this season. "Our first half was as good as I've seen from any side I've had for a long time," Moore told BBC Tees. "It was a longer performance and not just 45 minutes. "We had a 70-minute spell where we were the better side and we're disappointed we're not winning." The match was Ronnie Moore's first visit to Tranmere since his sacking by Rovers in April for "breach of contract", and he received a standing ovation from large sections of the Prenton Park crowd. "It's humbling but I think they realised the position I was in and how stupid it was," the 61-year-old told BBC Tees. "It was fantastic, I had a lot of time here as a player, manager and coach, and to get everyone clapping like that was wonderful for me." Moore's side are essentially 10 points adrift of a safe position in the table with another 19 fixtures left to play, given their minus 28 goal difference. Fenwick's strike was his second in the last three matches for the Victoria Park club, and third in 11 games following his move from Northern League side Dunston in November. "It was bits and pieces and he was in there to do it which was the pleasing thing," Moore added. "[Michael] Woods has had the shot, it's come back off the goalkeeper's hands who has made the save and Fenwick was in the right place at the right time. "He's coming on, there's a bit to work with there and I'm sure we can make him a better player."